PMI offers a full product line of RF Switch Matrices that operate over the 20MHz to 40GHz frequency range. Three standard models are offered that cover this frequency range, namely 20MHz to 3.0GHz, 2.0GHz to 18.0GHz, and 18.0GHz to 40.0GHz. Any of the three models can be supplied as either a 4 X 4, 8 X 8, 16 X 16, or 32 X 32 non-blocking matrix. All models offer switching control via TTL, RS232, RS422/485, Ethernet and via the front panel touch screen LCD. 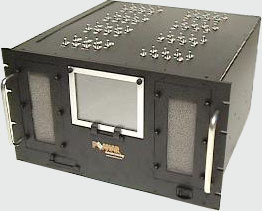 All units are supplied in a ruggedized 6U, 19” Chassis. Integrated Switch Matrix Example - Click Here.